Dhaka, Dec 12 (Just News): Prime Minister Sheikh Hasina today said influx of a huge number of Rohingyas from neighbouring Myanmar has caused severe effect on Bangladesh's forest and environment, creating a major challenge to climate adaptation. "Bangladesh has been facing a huge challenge owing to the influx of over one million forcibly displaced Rohingyas from Myanmar. On humanitarian grounds, we have given them shelter on 1,783 hectares of our forest land in Cox's Bazar," she said, adding the Rohingya crisis has severely affected forest and environment in that area. The prime minister said this while delivering a statement at the High-Level Segment of the One Planet Summit here this afternoon. The One Planet Summit is an alliance of hundreds of global leaders from all sectors for accelerating the collective actions against climate change, particularly to find new means of financing for adaptation and mitigation. The Bangladesh premier joined the "One Planet Summit" at the invitation of three co-organisers -- French President Emmanuel Macron, UN Secretary General Antonio Guterres and World Bank President Jim Yong Kim. Sheikh Hasina reiterated her call to the developed countries to fulfill their commitments in bringing climate justice and meeting historical responsibility. "We can secure the world only through shared responsibility ... our collective commitments and actions for resilience and adaptation would contribute to peace, stability and prosperity as well as addressing inequalities across societies," she said. Sheikh Hasina said Bangladesh is one of the most vulnerable countries to the impact of climate change although it's not responsible for this threat. "Yet, with our limited resources, we are addressing the consequences of climate change by mitigation and adaptation," she said. The premier said climate change issues have been mainstreamed in Bangladesh's sustainable development strategy aimed at becoming a middle-income country by 2021. "Despite being a developing country, Bangladesh spends over one percent of its GDP in combating climate change," she said. Reiterating Bangladesh's commitment to prioritizing the water sustainability issues in all of its economic, social and environmental actions, she said as a member of the UN-WB High Level Panel on Water, Bangladesh is firmly committed to addressing the issue. "We are making our agriculture climate resilient and reducing dependency on ground water for urban water supply," she said. The summit kicked off at La Seine Musicale, a music and performing arts center, located at Ile Senguin island in the western suburbs of the French capital. Over 100 world leaders along with 2,000 participants from non-governmental organisations, foundations, public and private sectors are taking part in the summit. 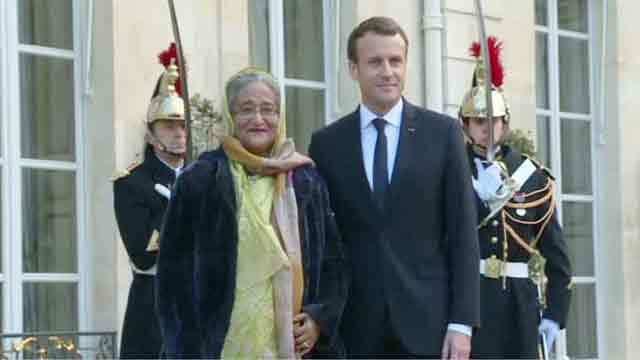 The Bangladesh prime minister renewed her commitment for implementation of the Paris Agreement and praised French President Macron's leadership on climate change issues. Sheikh Hasina said one of the means to address the challenges of climate change and environmental degradation is afforestation. "So our government has already undertaken massive projects for plantation programmes," she said. The premier said a flagship project costing USD 50.76 million is underway for conservation of the "Sundarbans" - the largest mangrove forest and a UNESCO world heritage site in Bangladesh. In the coastal region, she said, green belt is being created for protecting people from cyclones and tidal surges, coastal erosion and saline water intrusion. "Around 67,000 hectares of land has been identified for afforestation in this region," she said. Sheikh Hasina said her government would take necessary programmes for increasing two percent tree coverage in Bangladesh, from the existing 22 percent to 24 percent within the next five years.